Art Moves Midtown 5K & Minnie’s Mile – May 9, 2019 | NC Race Timing and Running Events | Go Time! Come out for this fun Thursday evening event in Midtown Wilmington! The Art Moves Midtown 5K will feature some of Wilmington’s most scenic mileage of the Cross City Trail as it loops through Halyburton Park. The Minnie’s Mile will be a flat course on the Cross City Trail and serves to raise awareness of local visionary artist, Minnie Evans. The CAM campus will be a lively spot with music and art all around. Exhibitions at Cameron Art Museum are FREE before/after your race. This race also includes Art Activities & Games for Kids of all Ages, Artist-made Finisher’s Medal, and Post Race snacks for participants. Art Moves Midtown benefits Cameron Art Museum and its education mission. CAM is our region’s premier art museum; a cultural place that brings people of different cultures together and nurtures a lifelong curiosity about, and connection with the world and one another. CAM is a non-profit art museum fully supported by the generosity of its donors and receives no regular on-going government funding. Awards for both races are handmade ceramic vessels by local artist Steve Kelly of Kelly Pottery, Wilmington NC! Race Shirts will be available to PURCHASE for $12 (plus tax) with registration until 11:59 PM on Wednesday, April 24th, 2019. The shirts are available in Youth S-M and Adult Unisex S-XXL cut sizes, and are made of a cotton/polyester blend. MEDALS: The first 250 finishers will receive a Medal! 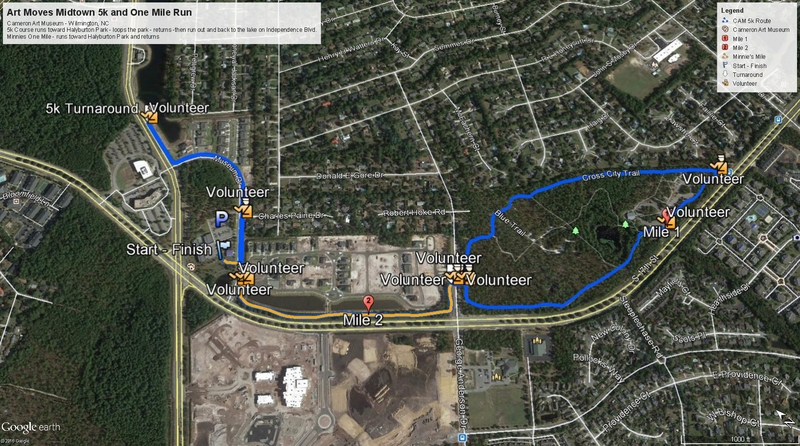 Minnie’s Mile begins at Cameron Art Museum and goes South on Cross City Trail to a turn-around near George Anderson Drive. The 5K begins at Cameron Art Museum lower parking lot and connects with Cross City Trail, looping Halyburton Park Trail, passing CAM to a turn-around near the Independence and Museum Drive intersection. This race course is also stroller and wheelchair friendly! However, dogs are not allowed on this course so please leave them at home or with a non-running spectator. Some parking is available in CAM’s visitor parking lot and along Museum Drive. Additional parking is available at Barclay Center parking, across from CAM, near the Museum Drive and Independence Blvd. intersection. 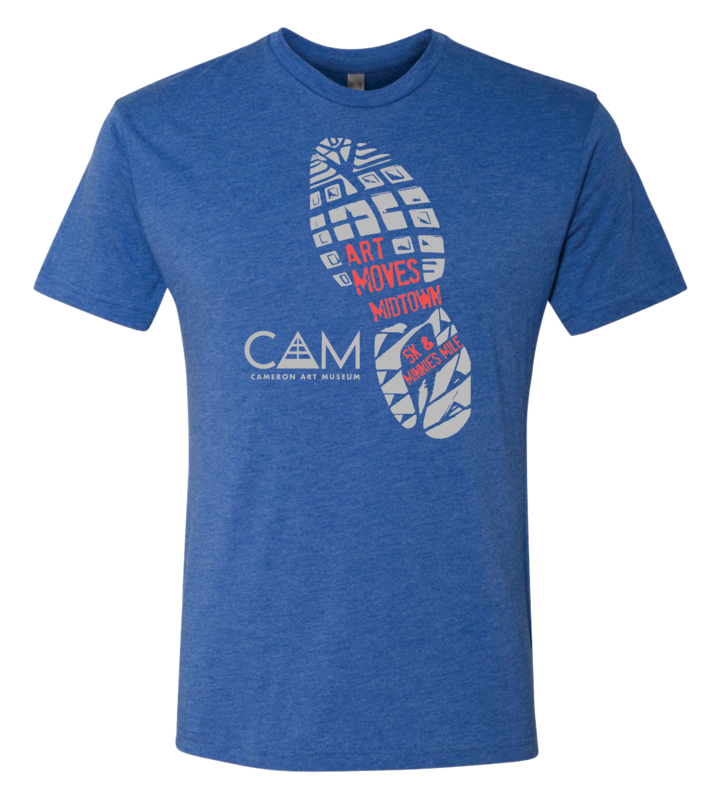 Special CAM Exhibits – FREE on Race Day! On view through September 8, 2019. 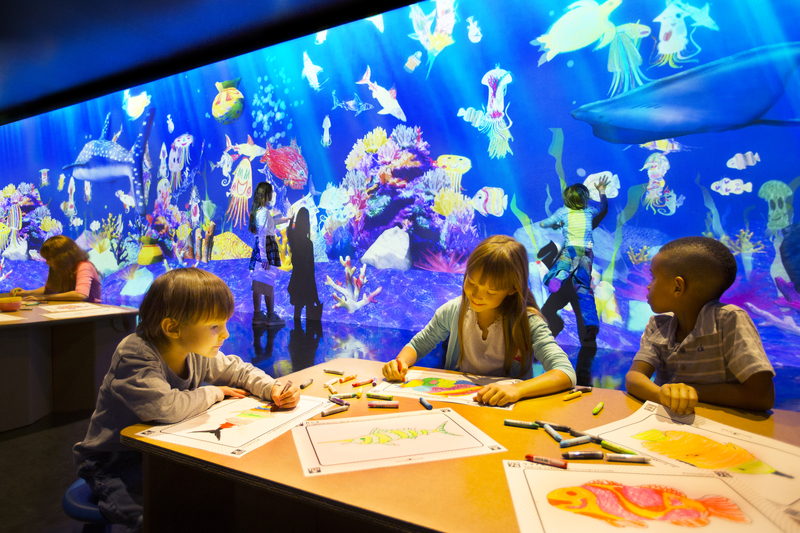 Visitors can observe the power of their creative imagination at the Sketch Aquarium Exhibit. Each participant is invited to color a drawing of a sea creature of his or her preference. Once completed, the paper is scanned and the image is projected onto a giant virtual aquarium. Visitors see their creation come to life and swim with all of the other sea creatures and may also touch the fish to see them swim away, or touch the virtual food bag to feed the fish! On View March 29 – September 22, 2019. The common thread of the need to create is shared by four self-taught artists from CAM’s permanent collection: Minnie Evans, Clyde Jones, Annie Hooper and Vollis Simpson. 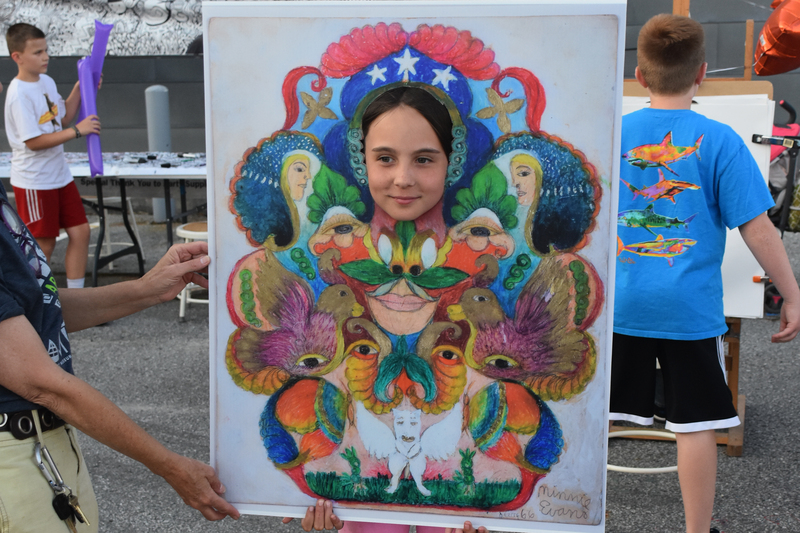 Whether inspired by their dreams, religious beliefs, or their internal emotions these self-taught artists have shaped the creative culture of North Carolina and broadened the boundaries of Outsider Art to the world.